San Pedro de Alcántara - just 10 kilometres west of Marbella on the road to Estepona. Enjoy the natural beauty of the Sierra de Ronda mountain range in the background. An ancient farming community, once famous for sugar cane, today San Pedro is a refreshingly unspoilt pueblo. Attractive beaches with chiringuitos (beach bars). Ideal stop over on the way to your Ronda visit as the road leads from San Pedro. The Hotel Guadalmina Spa and Golf Resort is bounded on three sides by golf courses and on the fourth by a beach. It is located 40 kilometres from Marbella on Spain's Mediterranean coast. The hotel is 21 kilometres from the bars, boutiques and nightlife of Puerto Banus. Selwo Park, a wildlife park featuring tigers, zebras and elephants, is 90 kilometres from the hotel. 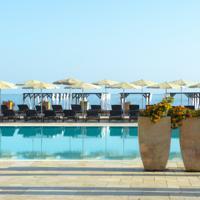 The hotel has its own private sandy beach and boasts two open-air saltwater swimming pools, including one for children. Guests can relax in the piano bar, which serves morning coffee, afternoon tea and a selection of wines and cocktails. Fitness Enthusiasts can work up a sweat in the gym, and golfers can practise their swing on the three golf courses, two 18-hole and one 8-hole, which encircle the hotel. This property is 15 minutes walk from the beach. Situated in San Pedro de Alcántara, this NH is just 1.3 km from the beach and 5 minutes’ by car from Puerto Banus. It offers free WiFi, and rooms feature air conditioning and a balcony. Coffee is available in the hotel foyer from 05:30 until 07:00. An informal cafe-bar serves an extensive breakfast buffet. From the roof-top terrace guests can enjoy views of the surrounding area. Guests also have access to massage services and a steam bath. Magna Marbella Golf Club is less than 3 km away from NH San Pedro. Malaga Airport is 60 km away. San Pedro de Alcantara is a great choice for travellers interested in the seaside, shopping and sunbathing. Sotogrande - one of the most luxurious sports and residential developments in Europe. Activities include golf, the beach, the marina and plentiful bars, restaurants and leisure centres. Located in Sotogrande, Hotel Almenara features a golf course with three 18-hole combinations, and several restaurants. There is also a spa and a communal outdoor pool. 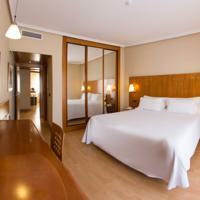 The Almenara’s spacious rooms are decorated in natural tones. All air-conditioned rooms have stunning views of the golf course or gardens, and include a minibar. Free WiFi is included throughout the hotel. The Almenara Golf Resort's Spa Elysium offers a hot tub, gym and sauna. Other facilities include the Sotogrande Golf Academy and a horse-riding centre. There are various restaurants serving Andalucian and international cuisine. Guests can enjoy meals on the outdoor terraces, or relax with a drink in Pentagrama's Bar. Almenara Golf Hotel is just 5 km from the Costa del Sol, and Gibraltar Airport is 25 km away. Guests can benefit from special rates at nearby golf courses. This elegant resort is set within beautiful gardens and surrounded by the San Roque Golf Course. The Suites at San Roque Club features an outdoor pool. The San Roque Suites offers 2-bedroom bungalows suitable for up to 5 adults. Each apartment features modern, elegant décor. The Suites at San Roque Club offer a professional golf shop, and guests are entitled to reduced green fees. There is a small shopping centre with a bank. There is free Wi-Fi in public areas. San Roque Club has various restaurants ranging from Mediterranean and Japanese to Argentinian and Italian. The nearest beach is 2 km from San Roque Club, and Valderrama Golf Course is a 10-minute drive away. The resort is 4 km from Sotogrande. Gibraltar is just 5 km away, while Gibraltar Airport can be reached in 20 minutes. You can reach Málaga Airport in around an hour.